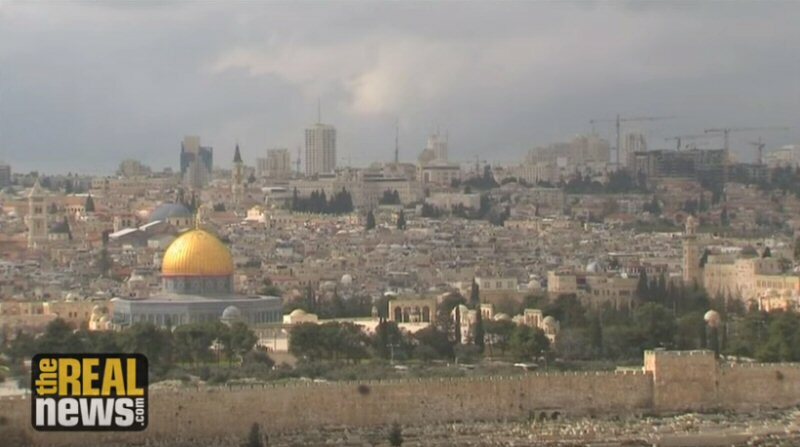 President Trump will recognize Jerusalem as the capital of Israel and move the American embassy there. Ali Abunimah of the Electronic Intifada says years of US policy set the stage. AARON MATÉ: It’s The Real News. I’m Aaron Maté. After vowing, “America First” at home, President Trump continues to push, “Israel First,” in the Middle East. Trump has decided to recognize Jerusalem as the capital of Israel and move the American Embassy there. Trump told regional leaders of his plan today ahead of an expected announcement on Wednesday. Israel’s illegal occupation of east Jerusalem has been a major flashpoint in the Israel-Palestine conflict and Trump’s decision provides a new level of US support. His announcement comes just days after the indictment of Michael Flynn revealed that Trump started doing Israel’s bidding even before he took office.In December 2016, the Trump team tried and failed to undermine President Obama’s decision to allow a U.N. Security Council measure condemning Israeli settlements in the occupied West Bank. I’m joined now by Ali Abunimah, co-founder of the Electronic Intifada. Ali, welcome. There was just a White House briefing with reporters talking about this move to move the embassy to Jerusalem. A White House official said that this is a recognition of reality that Jerusalem is Israel’s capital. Your thoughts on this announcement. ALI ABUNIMAH: Well, it sounds like it is just an announcement in the sense that the latest says that Trump is not going to actually move the embassy yet and will sign the waiver to delay that move for at least another six months. On the other hand, it’s a recognition of a reality that the United States has helped to create, of Israeli control and occupation and incremental ethnic cleansing in Jerusalem to force the Palestinians out, to cleanse the identity of Jerusalem from its Muslim and Christian aspects and to market Israel as an exclusively Jewish and Israeli city. The US is creating the reality that it claims to be recognizing. AARON MATÉ: The reaction that we’ve gotten so far, a lot of criticism of the decision. Turkey, for example, the leader there, President Erdoğan called it a red line that the US should not cross. Palestinian factions have called for three days of rage in response, protests over the decision. Referring to this as a red line, as opposed to all the other things that Israel has done, you pointed this out on Twitter that there’s sort of a double standard here in being outraged over symbolic acts but not seeing red lines in the many crimes that Israel’s committed up to this point. ALI ABUNIMAH: Exactly. I mean, there was a statement today from the Organization of the Islamic Conference, basically 57 Muslim majority states which reaffirm that Jerusalem is occupied and that all of Israel’s measures are illegal and so on. That’s fine and it’s fine for Turkey to take that position. The trouble is that Israel has gotten away with so much for decades, forcing Palestinians out, settling and colonizing east Jerusalem, as well as the rest of the West Bank, that, the lack of international response for so many years, the failure to hold Israel accountable has really opened the way for this.The European Union, for example, is warning against this move by Trump but what have they done for all these years? They surrendered the leadership of the so-called peace process to the United States. They utterly failed to hold Israel accountable themselves. Well, this is the result of putting the United States in charge and refusing to take action yourselves. AARON MATÉ: Do you think that this decision will finally push the Palestinian Authority to stop pretending as if it has a reliable ally in the US? I know it receives US financial support and has relied on that but how can they get away in front of their own people with continuing to cooperate with the US on things like security, “cooperation,” in the west bank when President Trump has handed them this humiliation of moving the embassy to Jerusalem? ALI ABUNIMAH: Yes, this comes just months after Mahmoud Abbas stood side by side with Donald Trump at the White House and praised the “Wisdom,” of Donald Trump and said, “Mr. President, with you we have hope.” It really is a sort of a, yet, another humiliation for Abbas. Look, I don’t think it will change their approach. I heard PA officials today in media saying how this undermines the position of the United States as an honest broker. I mean, who but the most diluted person could have ever thought the United States was an honest broker and that you only needed this to somehow make the US seem bias? The reality is they have no other strategy.The Palestinian authority is there because of US support and Israeli support and support of the European Union and not by virtue of really having support among Palestinians. Look, back in the summer when Israel made this move to try and tighten its control over the Al-Aqsa Mosque in Jerusalem. The Palestinians in Jerusalem surprised everyone with weeks of non-violent civil disobedience which drove Israel into retreat. That’s where I do see hope, is that despite decades of Israeli efforts to weaken the Palestinian presence in Jerusalem, to drive out Palestinian institutions in civil society, the ordinary people of Jerusalem, the ordinary Palestinian people of Jerusalem showed that they’re still determined to defend the city. That really matters. AARON MATÉ: Ali, on the point you made about the US not being an honest broker in this conflict long before President Trump came along, I want to ask you about this supposed peace plan of Trump. The Crown Prince of Saudi Arabia has reportedly presented it to Mahmoud Abbas and there’s been a lot of criticism of it. There was a piece in the New York Times called, Talk of a Peace Plan That Snubs Palestinians Royals Middle East.What was interesting to me about it, is that the elements of the Saudi-Trump peace plan that people are rightfully saying is not very fair to the Palestinians, sounds exactly like the so-called generous peace plan that Ehud Barak and Bill Clinton offered Yasser Arafat in July 2000 for which Arafat was denounced for rejecting, even though it’s basically the same thing. It’s most of the illegal settlements stay in the west bank, Palestinians don’t have sovereignty over actually east Jerusalem and there’s no right of return for refugees. ALI ABUNIMAH: You’re exactly right. It’s warmed over, rehashing of the same plans that date back to the 1990s for a Palestinian bantustan, which would be a state and name only. Palestinians living under permanent Israeli occupation apartheid, separated into little bits of territory here and there where they can say we have a stake but in reality they have no control. It even revives this laughable idea from the 1990s, the so-called Abu Dis Plan where the small village of Abu Dis, which is near Jerusalem would be renamed Al-Quds and the Palestinians could declare a capital there, instead of in the actual city of Jerusalem, which would be completely swallowed up by Israel. It really contains nothing new. By the way, Abu Dis currently is a village that a large part of whose land Israel has confiscated to use as an illegal garbage dump. According to the Trump-Jared Kushner-Saudi plan, the Palestinian capital would be essentially in a garbage dump. ALI ABUNIMAH: One thing that’s important to note that’s different now is the regional context, where you have this Saudi Crown Prince, Mohammad bin Salman, who is pressuring the Palestinians to accept things that even Abbas can’t accept. The motivation there is to liquidate the Palestinian cause and push it aside as an issue that stands in the way of a full consummation of the Saudi-Israeli alliance whose main target is this obsessive enmity that Israel and Saudi Arabia have towards Iran. The Palestinians are the sacrificial lamb in that and in this sense, Jerusalem can be seen as the Saudi dowry or wedding gift to Israel. AARON MATÉ: We’ll leave it there. Ali Abunimah, co-founder of the Electronic Intifada. Thank you.